T&L Video Challenge 5 – What did staff get up to? In groups of three, the students of 7L were asked to ‘act out’ their understanding of the Chinese creation myth we had read. I specified that only one student could speak during the performance (the narrator) and that the other two students would have to mime and use their bodies. Given the time frame that was allowed, I was delighted and surprised with the performances I saw, especially those incorporating what can only be described as stylised dance. 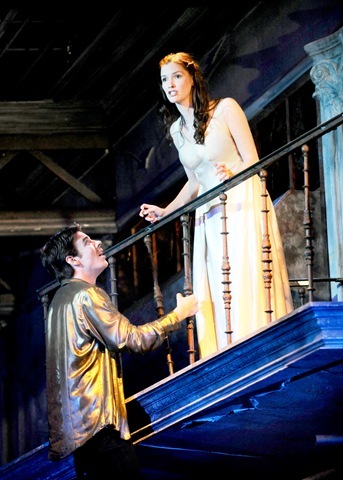 ‪Rather than just get Year 10 to perform a scene from ‘Romeo and Juliet’ (which would have made the challenge a bit easier! ), I got them to use what they knew of characters and events to make suggestions about how a scene should be performed. I chose some students to give an ‘awful’ rendition of a scene: no expression, no movement, no facial expression (I wrote this as a modernised, summarised version for ease). I then assigned sections of the text for groups to interpret and make notes on how to improve the original, so that it was a better reflection of characters based on their personality / behaviour / previous scenes. The students then performed the scene again, making adjustments as peers gave feedback and advice based on their interpretation. As part of getting ready to go on their trip to Germany, Year 7 German had been learning transactional information, including ordering and paying for food in a café. Perfect opportunity for a role-play! I gave them certain requirements (e.g. that everyone must have at least four lines, everyone must give an opinion and there should be an element of “polite conversation”). On Monday, my Year 7 Maths class (top set) looked at solving equations with x on both sides. Some had difficulty in visualising terms crossing sides and changing from say, +40, to -40. There were a number of mistakes made. I decided to use this opportunity to do a lesson on loci, a concept that students often struggle with visualising and remembering. The locus (plural: loci) of something is basically the path that it traces out (e.g. the locus of a ball that has been kicked upwards would be an arc tracing out the path of the ball). I took my class to the back playground to have a bit more space and told one student to stand on a fixed point. The rest of the class then had to stand so that they were all the same distance from the student, without talking about what they were doing. After a bit of miming and communication the students realised that they all had to stand in a circle around the original boy, showing that the locus of points equidistant from a fixed point is a circle. This process was repeated for a number of different loci that students need to be able to recognize. Once back in the classroom, I could easily refer to our “acting” when completing written questions. This process worked really well as student can sometimes find this concept a bit abstract to begin with, but when they were faced with a diagram showing a line or two points they could visualise which part of the acting out session that was and draw in the required locus. I used the challenge to assess the students’ recall of a story they had seen in an animation the week before. 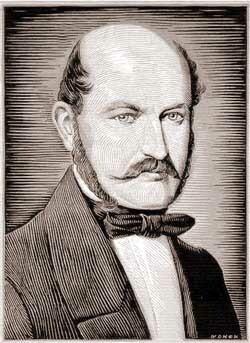 Students were asked to act out the story of Ignaz Semmelweis – a Hungarian doctor who realised that doctors going between dead bodies and the midwifery units in hospitals were responsible for the spread of child bed fever. They enjoyed acting the story out and each group was able to show how Semmelweis’ insistence on hand washing between patients was of crucial importance. Although allowing them to do this took 10-15 minutes, I was confident they had reinforced the story in their minds and it was a good use of time. 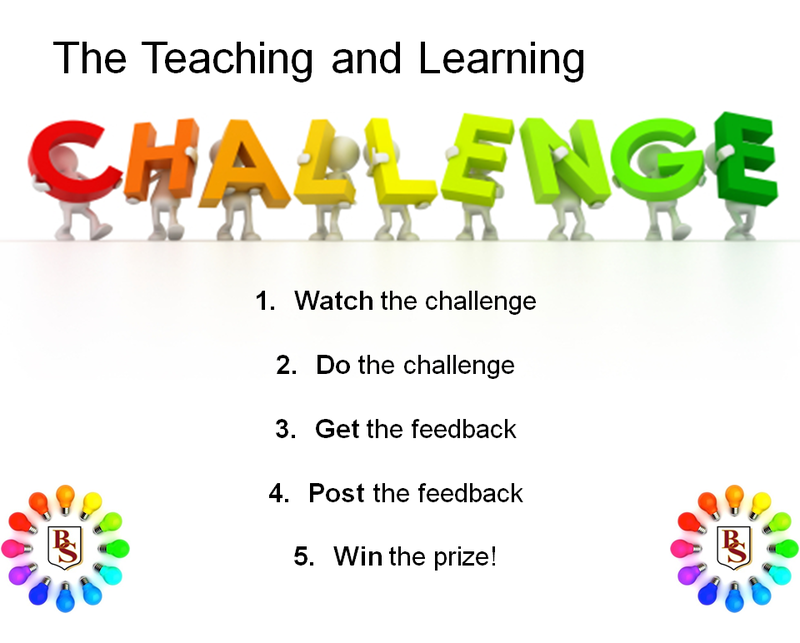 Teaching & Learning Challenge Video 5 – Act it out. The final half term of the year will see teachers at Beaumont rising to the final T&L Video Challenge of the year. The video this time is from Beth Ashton (MFL) and the challenge is to get students to “Act it out”. ‘It’ being their learning from the lesson: a scientific process, a historical conflict, a demonstration, a mathematical equation, a meeting of two minds, a poem, a painting, or whatever are hoping that they will take away and remember. Act it out to show what’s been understood or to help students explore something new. The challenge begins on Monday 15th June and is open until the end of Friday 26th June. Get a student in your class to sign the Challenge Slip. Post the slip into the Challenge Box in the Staff Room. The idea to run “Beaumont Maths Week” arose after attending the Beaumont Teachmeet last November. I attended Sue Lutz’s seminar on “Raising the profile of your department” and came away feeling inspired. I wanted to do something that would get students thinking about the maths skills they were learning and how they could apply them in other areas, and also wanted to promote enthusiasm and excitement for maths around the school. We launched Maths week with an assembly where I shared the story of how I was drawn to the subject of maths when I was in school and the aspects of the subject which I found difficult. The idea of doing an assembly was quite a daunting prospect, but I knew that it would create the right kind of buzz about the subject and the activities that were coming up. I booked myself in for an assembly slot before I could overthink the idea and talk myself out of doing it so, although I didn’t sit down to properly plan what I would speak about until February half term, the thought process began months before and I always had a vague idea of what I wanted. I felt nervous before I began but once I started talking the story just came naturally. The high that I felt when I finished (and realised that people liked it) was amazing and it’s something I’m really glad I did. There were various activities run during “Maths Week”. Because the idea had formed in my mind so early on in the year, I actually had a few months of being able to let ideas float around in my mind and decide what was good and what wasn’t, or what would work better than something else. This meant that when I sat down to actually write the challenges and questions I had a clear idea of what I wanted. The staff questions were a big hit and I was so pleased with the response from so many different departments – who knew we had so many talented mathematicians? The competitive element obviously made it a bit of fun and I’m already thinking about more difficult questions for next year. It was really great the way staff talked about the quiz with their classes and the students who helped teachers couldn’t wait to come and brag about it to the maths department. There were house activities for each year group and again, the response from these was amazing. It was great to see so many students working on problems together and to have students come up to me to chat about what they were doing and see the enthusiasm and excitement it had created. There was the Numeracy based T&L Challenge which staff also got involved in and which really highlighted how numeracy skills can be transferred across subjects. 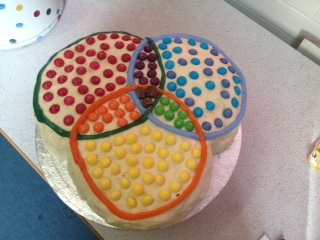 As the finale, we ran a Maths-themed bake off and cake sale for the 6th form. 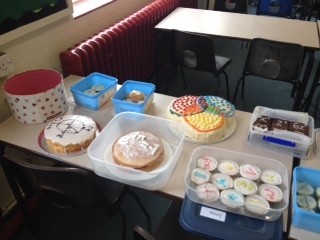 This was the part I was most worried about as I knew that if there weren’t enough entries we couldn’t then have the cake sale that had been advertised. 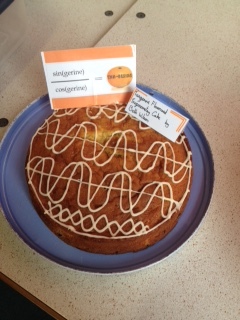 Believe it or not, I actually had dreams the night before about setting up a shop with nothing to sell, My fears were unfounded however – we had so many entries that looked and tasted amazing and the subsequent cake sale was so popular that it only lasted about ten minutes before we were completely sold out. 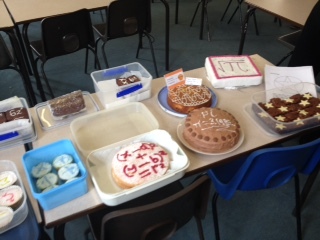 We raised almost £90 which we donated to the National Numeracy Organisation whose work you can read about here. For the week to be successful, there was a lot to organise, but with everyone in the lovely Maths Department pitching in, as well as the 6th form Maths Captains, all of the effort was definitely worth it. I was so pleased with the response from staff and students and am already looking forward to next year. T&L Video Challenge (4) – Where were percentages used? “Students were asked to peer assess each others’ gymnastics performances and I had written a list of criteria on the board that had to be included. Students were then given a target board with 50%, 75% and 100% written on them in different sections of the target board. After watching each others’ performances, students had to indicate how much of the criteria was included in the performance. Students said they found this an easy way to feedback to each other and make a quick decision over something that they would normally take longer over. It also encouraged quick and easy self reflection.” Elena Dundjerovic (PE, Business and Economics). “I used percentages to jazz up a year 9 topic – talking about how much money they save and what they are saving up for. I wanted the pupils to engage with the vocabulary in a different way, and also hoped to increase their engagement. The previous lesson they had done some speaking practice and carried out a survey. The following lesson we looked at analysing statistics using percentages, based on a comprehension starter that I made. I think they found it challenging, especially as they weren’t expecting to be working out percentages in a German lesson. But by the end of the lesson they were fully on board and proud of the work they had done. It’s definitely something that I will try again, but next time I will think a little more about differentation from a Maths perspective, as I was surprised at how some of them struggled with the percentages. It was, however, nice to see different pupils flourishing in the lesson because they could show off their Maths ability a little more, whereas they normally struggle with German.” Beth Ashton (MFL). “I got students to use percentages to work out how much of the Language GCSE each exam question was worth. The exam (total) is 60% which is a bit scary, so we broke it down to more manageable amounts. It helped to show them where they needed particular focus as some questions had greater weighting towards the final outcome.” Frances Jackson (English). “I simply asked students to convert their latest controlled assessment score out of 30 into a percentage. Two diligent girls found this straightforward as they scored 100%” Michael Tatham (English). 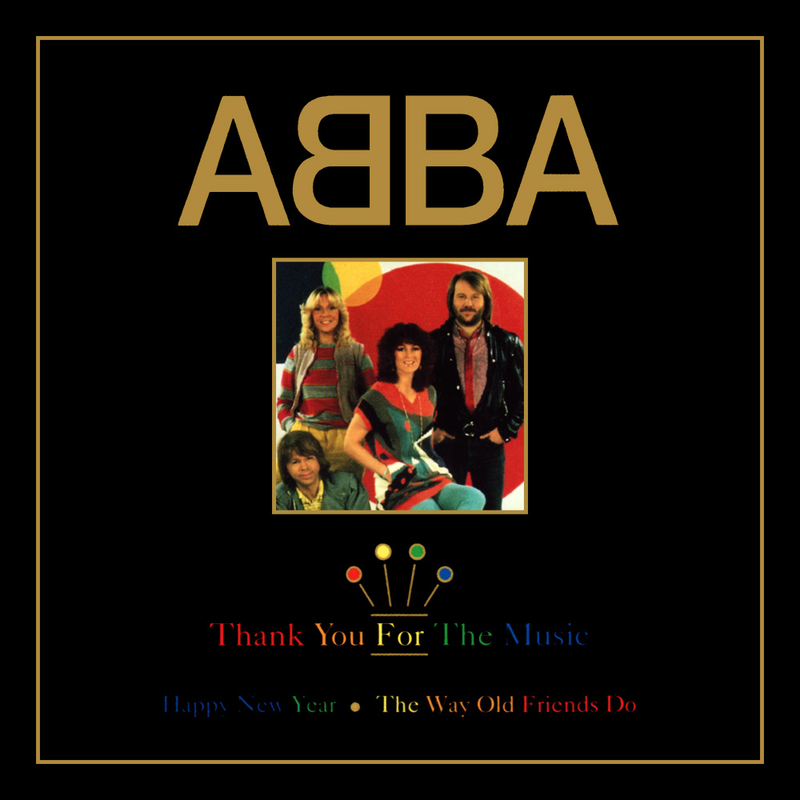 “We are doing the topic of statistical analysis in Psychology A2 at the moment and were discussing the common level of significance we use in psychological research, which is p˂0.05. The point the students needed to understand was that this means we can only ever be 95% confident that our results are not due to chance and there is always a 5% margin of error. This means that there is a 1 in 20 chance that our results are not actually statistically significant even if our statistical test says they are. This is all in the context of knowing which statistical test is appropriate for the kind of data and research being undertaken, which appears on our final A2 paper.” Carly Thomas (Psychology). As part of Numeracy week (9 – 13) March) the next Beaumont Teaching and Learning Video Challenge has a distinctly mathematical theme. So brush up your percentage skills and have a look at the ideas in the video from Fiona Rosler. The Video Challenge slip is in the resources section on the home page (and for Beaumont Staff it will arrive in your pigeon hole). 4. Have a chance of winning a ‘star’ prize the following week if their slip is selected from the Challenge box. Remember to share your ideas from the challenge week by sending a couple of sentences about what you did and maybe a picture and we can pull them all together in a future post. Challenge week starts on Monday 9 March. As mentioned in the video, listed below are some subject specific ideas for this challenge. We’ve chosen subjects in which it might not be immediately obvious where you can incorporate percentages in your lessons. If none of the ideas appeal to you, don’t forget that even small things like having students calculate assessment scores, examine grade boundaries or even take a short class survey are all positive ways of encouraging students to use their mathematical skills in other subjects. English – Encourage students to vary their writing by counting the number of times a certain word or sentence starter is repeated within a paragraph or piece of writing. This amount can then be expressed as a percentage of the total words or sentences. This could also be applied to texts that are being studied by looking at repetition within various authors’ works. Languages – A variety of class surveys could be done in the target language, incorporating the keywords of the current topic – e.g. Family, shoppin, travel. The results could be expressed as percentages and even put into a pie chart if you’re feeling creative! There could also be a “beat the teacher” challenge where the student comes up with a maths question based around percentages, but with the numbers written out in the target language, e.g siebzehn instead of 17. Geography – A variety of class surveys could be done to gauge reactions to current events with results expressed as percentages – the students could work out the percentages themselves! Other relevant areas include population statistics of various countries, the natural resources present in various countries, the percentage of different components that make up soil and the percentages of different gasses in the atmosphere. History – Percentages of casualties in wars from different countries and looking at how population stats have changes over time. Students could be asked to imagine they lived in a certain time period and asked to “vote” on various issues. Results of the vote expressed as percentages and a discussion where students must back up their arguments for or against an issue, substantiating claims with what they have learned. Music – Looking at how record companies make profits and how they divide up profits between artists. Linking half beats and eighth beats to fractions and subsequently linking fractions to percentages. Art – A somewhat basic way of incorporating some numeracy into your lessons would be to have an informal discussion with students about the percentages of different colours they would need to mix to create new colours. This could be done before, during or after a painting lesson – for example if you want a light purple colour would there be a higher percentage of red or blue? Would it matter? What percentage would white make up? Simple questions like this is a great way of encouraging students to think about mathematical concepts in a different context to what they are used to. Textiles – Think about percentage profits (or losses) for fashion designers – why are some clothes sold for so much more than others? What makes a Primark dress different to a Vera Wang? Could discuss what kind of costs designers need to take into account, what kind of market they are appealing to, what kind of materials they use…and how does all of this affect their sales and ultimately their mark-up percentages? RE/Ethics – Opinion polls on various issues, looking at results as percentages and having students back up their arguments. Looking at zakat as one of the pillars of Islam and calculating percentages that would be given to charity (thanks to CGr for this!). Food tech – Examining and discussing nutritional content of foods and relating to the recommended daily allowances as percentages. IT – Surveys/polls looking at proportion of people using different brands of PC, laptop, tablets. Looking at percentages of various age groups that use different social media sites. 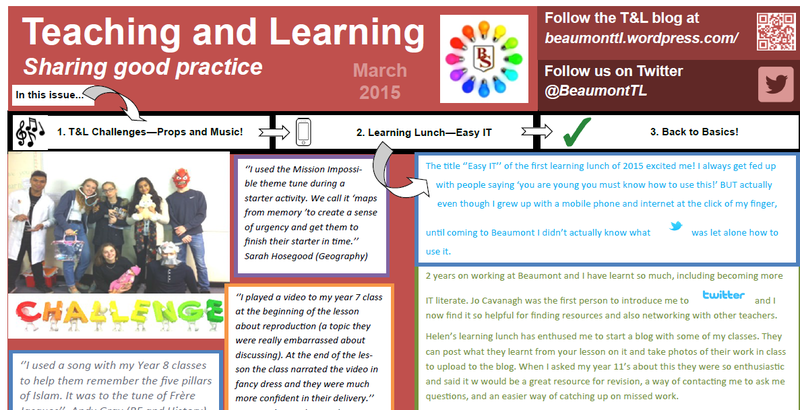 In our third Teaching and Learning Video Challenge, what did staff at Beaumont get up to?